Tip saucepan so chocolate runs to one side. Dip bowl portion of each spoon into chocolate. Sprinkle with candy decorations. Place on waxed paper. Let stand about 10 minutes or until chocolate is dry. Get the whole family involved with this fun recipe. • Delegate dipping, sprinkling and wrapping to different people or teams. • Double-dipping is encouraged for spoons. Dip first into dark chocolate, then after dark chocolate has set, dip into white chocolate, leaving a hint of the dark chocolate showing. 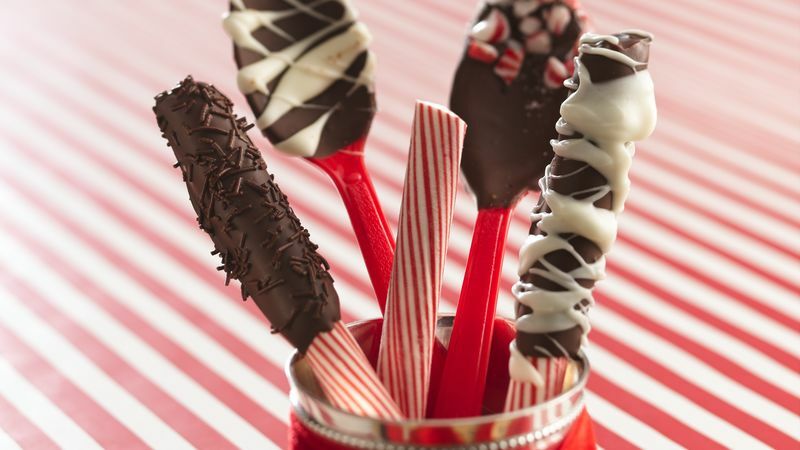 Or, drizzle melted chocolate in a zigzag design over spoons. • For a larger gift, put several wrapped chocolate spoons in holiday mugs. Include pouches of cocoa mix or special coffees. • Keep a basket of chocolate spoons, wrapped and tied with ribbon, by your entryway. As guests leave, surprise them with a sweet treat.